Tiokasin Ghosthorse, Lakota host of First Voices Radio, interviews Ofelia Rivas, O'odham, founder of O'odham Voice Against the Wall. Ofelia speaks on the militarization of O'odham lands and describes how O'odham language and ceremonies have survived since time immemorial. They have survived the Bush administration, and will survive this new era of fascism. Speaking from her home on the border, Ofelia describes how difficult life has been for O'odham to continue their ceremonies and way of life. Ofelia explains how now Tohono O'odham politicians are playing into the games being played by Trump as he pushes the border wall. "But we don't see them here in our community," she said of the tribal politicians. She said traditional O'odham in the western part of the Tohono O'odham Nation have been diligent and are keeping the language and culture going. "We see what is happening to our young people, to our land." The Border Patrol has violated O'odham rights on this land, where O'odham have lived since the beginning of time. She describes how Bush built a vehicle barrier on O'odham land and waived 37 laws. The Bush administration removed O'odham ancestors from their burial places to build this vehicle barrier. She describes how the governments violate their rights as traditional people. She also describes being imprisoned in Mexico, while building solidarity with the Zapatistas. Tiokasin asks Ofelia about recent statements in the news media, made by elected Tohono O'odham officials, concerning Trump's border wall. Tohono O'odham officials have responded to Trump's plan to build a border wall by saying, "Over my dead body." Ofelia challenges the Tohono O'odham Vice Chairman who made the statement to actually come out to the traditional O'odham communities on the border, to actually walk the border, so he will know what to actually say to the media. "Politicians are politicians. It is a political move. He needs to do some work at home first," Ofelia said of the Tohono O'odham Vice Chairman. She said the O'odham way of life, includes animal life, plant life, holy mountains, and sacred places. "That is who we are as O'odham people." Ofelia speaks of the hummingbirds outside feeding on the cactus flowers, and how the spy towers, with microwave, will affect the people and all life forms. It affects the migration of the people. Ofelia said O'odham knew the instant it happened when their ancestors burial places were dug up. "We are all connected. We should all care about each other." "This militarization has really traumatized the people." O'odham have been handcuffed, thrown on the ground, and their ceremonies disrupted. "It is not just my voice, it is the voice of my ancestors, who have been speaking for years and years." O'odham want to live in peace and harmony with the land. Ofelia said that the drug cartels have flourished from the California to Texas border, because of the weapons provided to the cartels by the U.S. government. 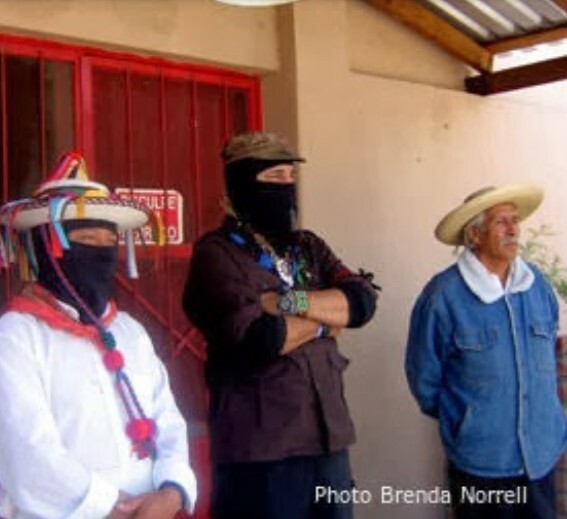 In regards to the current laws, Ofelia explains how Tohono O'odham are now criminalized, and can face jail time, on their own land, for giving water and food to desperate, dying migrants. 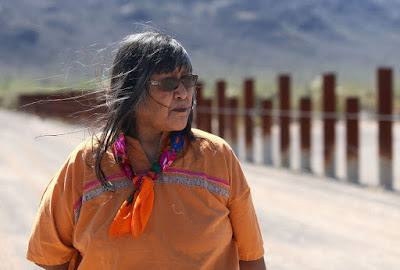 Ofelia describes how 18 U.S. surveillance towers are being pushed by the U.S. government on the Tohono O'odham Nation. She questions why they are all here, on O'odham land. "They have to monitor us 24 hours a day." Ofelia also questions if migrants are stopped from coming across the border, then who will do the hard labor, like picking onions. Ofelia said traditional O'odham remain opposed to the policies of the U.S. government. Please listen to Tiokasin's second interview on the radio program, with Chairman Aaron Payment from Sault Ste. Marie Ojibwe Tribe.